Since 1990, the Beatitudes Campus Foundation has been the philanthropic partner of Beatitudes Campus senior living community. Our Foundation helps continue our non-profit mission to serve seniors at Beatitudes as well as in the local community and the greater Phoenix area. You can contribute in a variety of ways to our non-profit retirement community, from becoming a volunteer to providing goods and services to donating a monetary gift. Whether you choose to donate your time or give to one of our special charitable funds, you’re helping to make an impact in the lives of seniors. Click here to learn more about our annual Power of the Purse signature fundraising event. CAREcorps promotes the core values of Beatitudes Campus by encouraging inclusivity and inspiring purposeful aging by providing opportunities to serve. Your time, talents and effort are extremely valuable. At Beatitudes Campus, we’re grateful to have an amazing group of volunteers working together to enhance life in our senior living community. Our volunteer program includes residents who live at Beatitudes Campus as well as individuals from the greater Phoenix area. We would love for you to join us. These are just a few of the volunteer opportunities available at Beatitudes Campus. To share your time and talents, call our volunteer coordinator at (602) 544-8526. This fund provides financial assistance to Beatitudes Campus residents who outlive their resources and are unable to afford their housing and healthcare costs. Contributions make it possible for those on ALTCS, Arizona’s Medicaid, to continue to receive high-quality care and services at Beatitudes Campus. 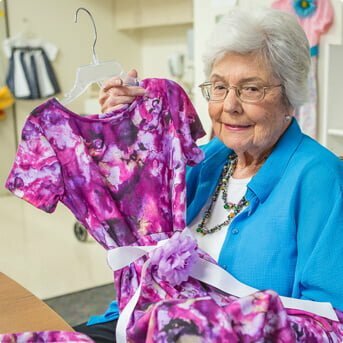 Created in honor of Dorothy Stetson and her family, this fund helps support Beatitudes Campus’ innovative educational, social and recreational services and programming for seniors. You can earmark your contributions for specific programs and projects. If you are considering making a restricted gift, let us know so we can ensure that we’re able to meet your goals. The Culver Nelson Founder’s Society recognizes individuals for their generosity, specifically those who have made a bequest or other type of planned gift such as a charitable gift annuity to the Foundation. If you would like to join the society and be recognized for your contribution, please let us know. To discuss your donation, call (602) 995-6136. However you choose to give, your donation will help support the needs of seniors and the greater Beatitudes Campus community. This provides immediate funds to enhance our programs, services and equipment. These gifts honor the memory of a loved one or acknowledge people on special occasions, such as birthdays and anniversaries. Donating products and services such as equipment, craft supplies, books and food for an event are always welcome. Appreciated stocks, securities and real estate can be sold or invested for the long-term to benefit the Foundation. You can make a significant gift to the Foundation through your will, charitable gift annuity, trust or life insurance. These gifts may offer tax benefits or other advantages such as a guaranteed income for you or loved ones. For questions about donating, call (602) 995-6136. David Davies, Attorney, David G. Davies, Ltd.
We invite you to come for a visit and volunteer alongside all of the wonderful people at Beatitudes Campus. Use the form below to contact us with your questions or comments. For immediate feedback, please call us at 602-910-2795.